This cloud formation above Burketown, Australia is known as The Morning Glory. You would think 30 years in the UK would be enough to see every type of cloud but this meteorological phenomenon is especially rare. 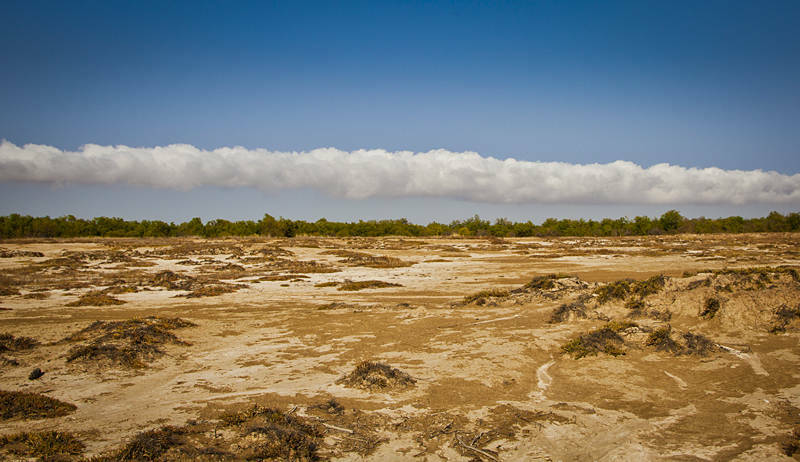 The roll or arcus cloud stretches from horizon to horizon but is only 100-200 metres above the ground. They have been seen randomly around the world but here in the southern part of the Gulf of Carpentaria is the only known location where the shape of the coastline ensures you have a good chance of seeing one every spring. This attracts glider pilots with the chance to ride a 1,000km wave. My next stop will be the Burke and Wills Roadhouse after which I will photograph the mining towns of Cloncurry and Mount Isa.